This work, as might be expected, exasperated the protestants against him; and to avoid their resentment, he crossed the water to England, in 1686, where James II. 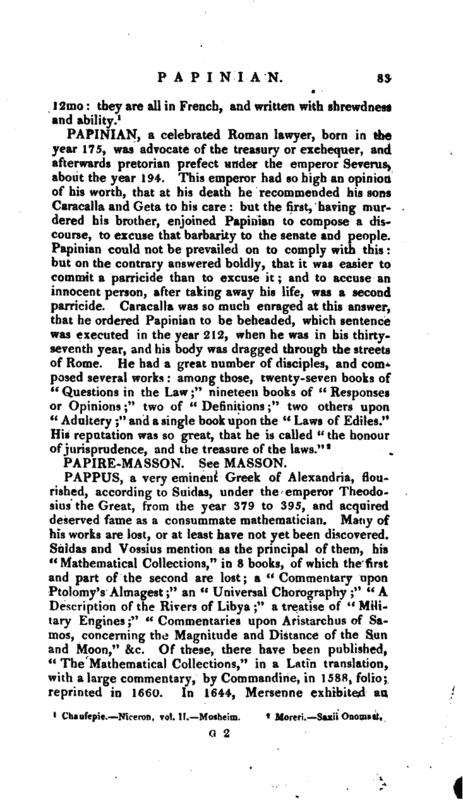 was endeavouring to re- establish popery. 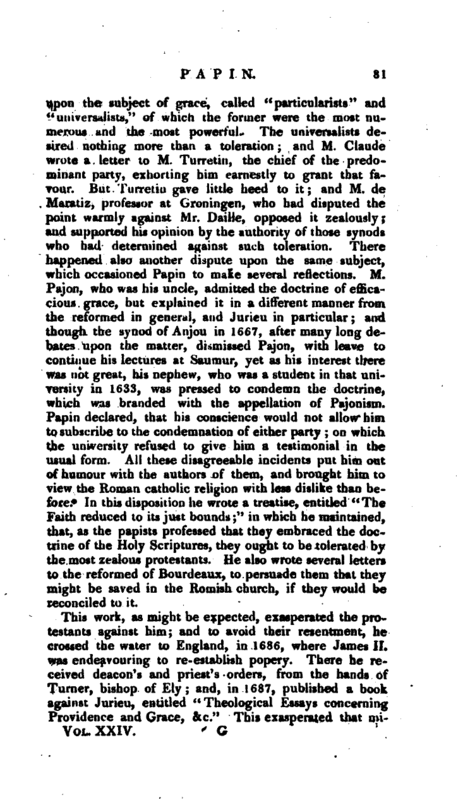 There he receive 1 deacon’s and priest’s orders, irom the hands of Turner, bishop of Ely; and, in 16S7, published a book against Jurieu, entitled “Theological Essays concerning Providence and Grace, &c.” This exasperated that | minister so much, that when he knew Papin was attempting to obtain some employ as a professor in Germany, he dispersed letters every where in order to defeat his applications; and, though he procured a preacher’s place at Hamburgh, Jurieu found means to get him dismissed in a few months. 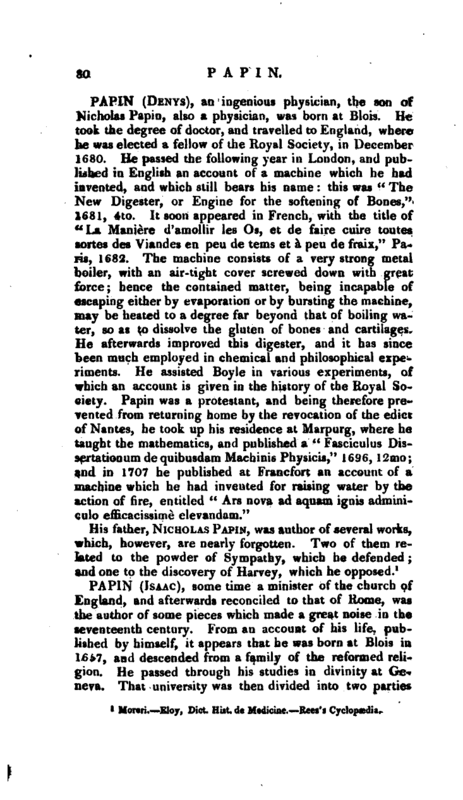 About this time his “Faith reduced to just bounds” coming into the hands of Bayle, that writer added some pages to it, and printed it. These additions were ascribed by Jurieu to our author, who did not disavow the principal maxims laid down, which were condemned in the synod of Bois-le-duc in 1687. 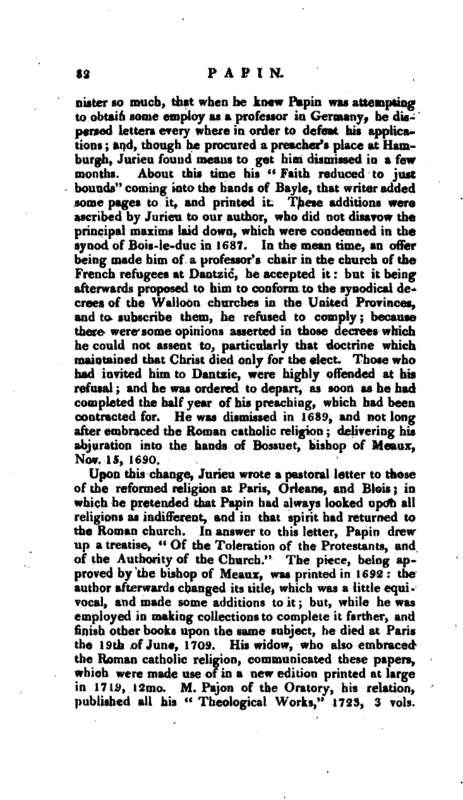 In the mean time, an offer being made him of a professor’s chair in the church of the French refugees at Dantzic, he accepted it: but it being afterwards proposed to him to conform to the synodical decrees of the Walloon churches in the United Provinces, and to subscribe them, he refused to comply; because there were some opinions asserted in those decrees which he could not assent to, particularly that doctrine which maintained that Christ died only for the elect. Those who had invited him to Dantzic, were highly offended at his refusal; and he was ordered to depart, as soon as he had completed the half year of his preaching, which had been contracted for. He was dismissed in 168^, and not long after embraced the Roman catholic religion; delivering his abjuration into the hands of Bossuet, bishop of Meaux, Nov. 15, 1690.